On Friday, 23 men's and 15 women's pickleball teams arrived at Tanglewood to play in the Heartland Games for Active Adults, coordinated by South Florida State College. Players came from several local clubs — Tanglewood, Highlands Ridge, Sebring Village, Sun 'n Lake and Crystal Lake — as well as from clubs in Zolfo Springs, Solivita, Orlando, Leesburg, Port St. Lucie and Fort Pierce. Lorrie Key, director of corporate and community education, and Lauren Reddick, community education specialist from SFSC, worked with the Tanglewood team to make this year's tournament another great one. 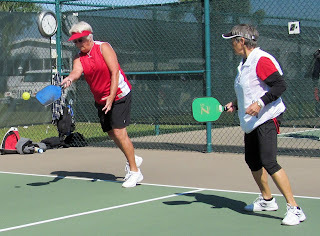 Key had nothing but praise for the Tanglewood pickleball volunteers, saying: "The college couldn't have run the tournament were it not for Tanglewood's help. They know how to run a good tournament and have the facilities and people to do it right." Complete tournament results will be posted shortly on the USAPA website.